Whether you are expecting twins or already have a toddler and are expecting another baby, one is for sure – you are going to need a good quality double stroller to keep things going in the right direction. Of course, there are also other things that you have to buy such as cribs, car seats, baby carriers, baby monitors, etc., but a stroller is the most useful one. With a double stroller, you can take care of other things, while your kids are together and are safe. Now, let’s face it, a good double stroller is a quite an investment, which is why you need to learn a thing or two on this matter, before being able to make an educated decision. That being said, this article is all about best baby strollers and choosing the one for your little angels. What is a double stroller? With all the double strollers on the market, parents must be confused not knowing which model to opt for. Since we understand that expecting twins or having another baby on the way is already exciting and overwhelming, we wanted to make that part of your life at least a bit easier, so we made this list of best double strollers in 2017. We will talk about the positive and the negative about each model, so as to help you make a smart decision on your purchase. So, let’s take a look at what these double strollers have to offer your little ones. 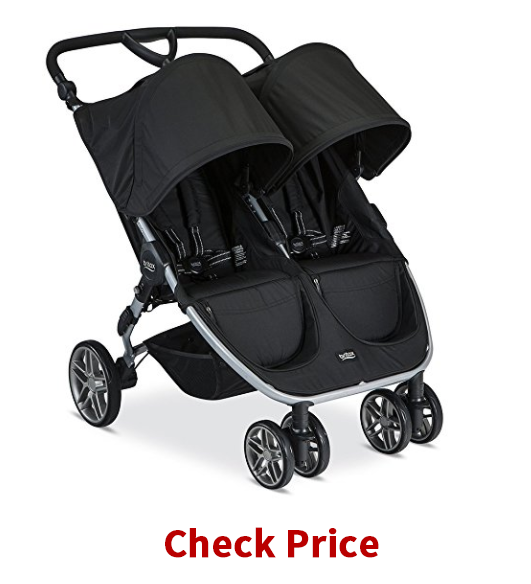 Our top pick comes from Britax and is a great deal for the money. This model is reasonably priced, as it offers many remarkable features to keep the ride smooth and safe. The All-wheel suspension system makes this model easy to push, especially over the bumps. 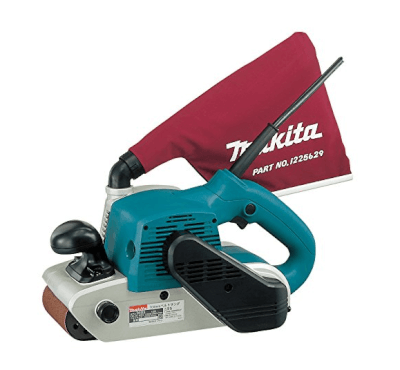 In addition, it features a lightweight aluminum frame and an adjustable handle for giving you more convenience. You can easily adjust the unit to your height and your needs, enjoying every step of the way. Not only that, but this model is also easy to store, thanks to its foldable design. You will pack a stroller in seconds! Furthermore, the frame lock ensures the stroller stays in place wherever you store the stroller. Needless to say, this makes transporting a breeze. As mentioned, this unit is made of high-quality aluminum, so it will last you for years and many kids, making the stroller a sound investment. Classic black is both elegant and practical, so you won’t have any difficulty with cleaning the unit. The seats are comfortable, so your kids will enjoy the ride. As for the downside, the seats cannot fully recline. Here we have a tandem stroller coming from Graco – affordable and stylish, perfect for kids up to 40 lb. (each). This model comes with lockable front wheels and great suspension system, so the stroller is easy to control. However, this model is not suitable for jogging because the wheels cannot stand the high speeds, as they tend to shake. Other than that, you won’t have any trouble with pushing this stroller. With separate footrests, both of your kids will have enough space to feel comfortable. The rear seat can be fully reclined, making it ideal for a baby that wants to take a nap. As for the design, this stroller folds easily, so it is a good choice for travelling. In addition, the combination of black and gray make it stylish. A cup holder is designed to give you joy on the go, which is a nice little bonus. If you are looking for a high-end model, then this is the perfect one. 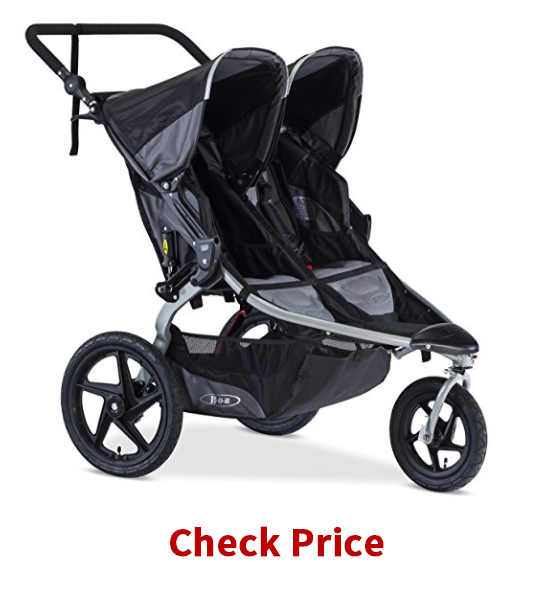 The BOB Duallie Stroller comes with all the bells and whistles, which is the obvious reason of its hefty price tag. However, this unit is well worth your money and you will be happy with it. First, this double stroller is easy to push. While swiveling front wheel makes easy work of maneuvering tight turns, the adjustable suspension system gives weight support. Meaning, the ride will be smooth and easy. In addition, the front wheel can lock forward to give better stability on the rough terrain. What we love about this model is the handlebar. 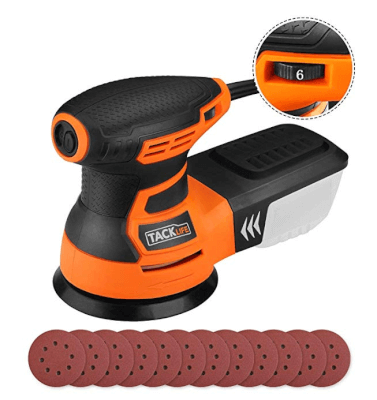 Namely, it can be adjusted to your desire, as it offers nine height positions. Thanks to this, you will control the stroller completely. Moreover, the seats are padded and can be fully reclined, for maximum comfort of your kids. In addition, the straps are durable and reliable, offering your kids safety. With a special folding design and an Extra-large cargo basket, this unit has everything a parent could ask for. As for the downside, this is side by side model. Meaning, it might be too wide for your doorstep, so make sure to check the dimensions first. 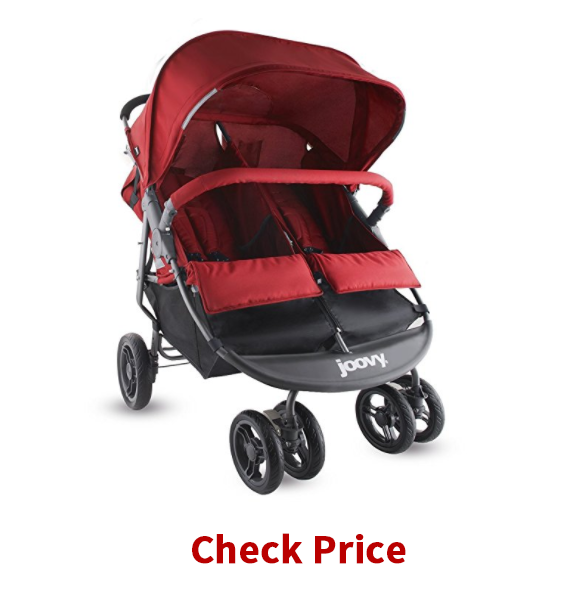 The Joovy Scooter is a good choice for those who don’t want to spend a lot of money but want a reliable double stroller. With its convenient dimensions, this stroller can fit 30″ width standard doorways. It is designed to accommodate kids that weigh 45 pounds each. This model will provide your kids with all they need so that they can enjoy the world around them. The seats are very comfortable and can be reclined. In addition, the footrests can be adjusted to your kid’s needs. A large canopy is perfect for blocking the Sun. However, what your kids will adore is a removable bumper bar where they can put their legs or hold tight when you speed up. 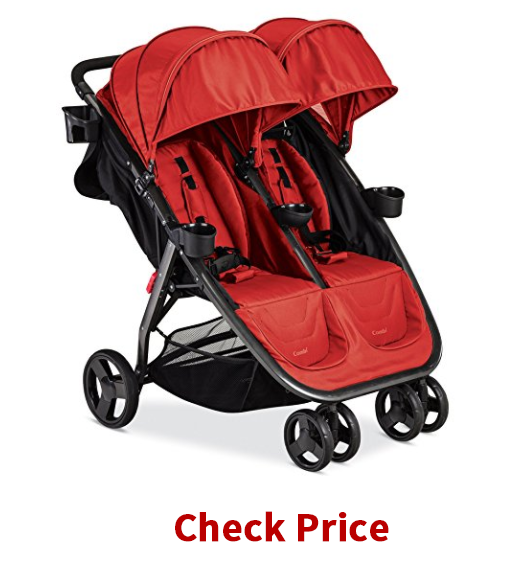 And what you will love is that this stroller is a breeze to clean, in spite of its red color. With a huge basket and zippered pockets, you can store all the important things for your kid as well as for you. But that is not all that this stroller offers. You also get two cup holders – perfect for your and your husband’s enjoyment on the go. As for the downside, this stroller is not designed for all-terrain use. But, it surely can stand the park trips as well as walks to the city center. Furthermore, this unit is heavy. 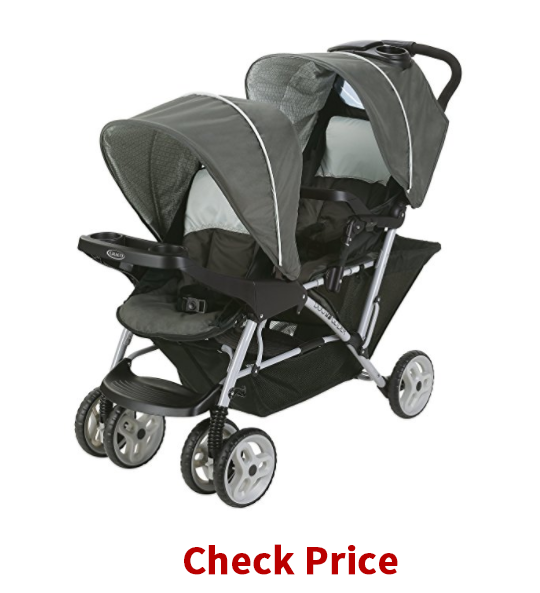 The Combi Double Stroller is a good choice for those who need a lightweight stroller. 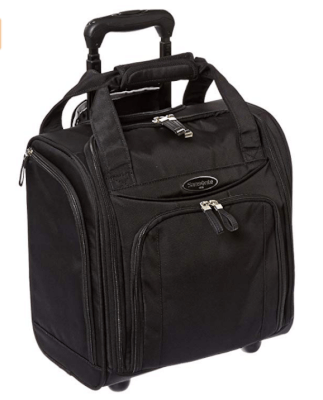 This model is compact thus is perfect for trips, walks, and going to the shopping mall. 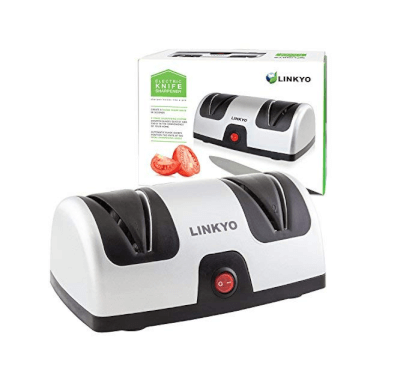 It is easy to store thanks to the one-hand folding design. Best of all, it will effortlessly fit into small cars. Made of 100% polyester, this stroller is a breeze to clean. With a 5-point harness system, your kids will be safe and sound, so no need to worry about that. As for the downside, the fabric will wear out quicker than with other models on this list. Also, the seats are not as comfortable as above-mentioned ones, but this model is designed for shorter use anyway. Well, it’s not like you have to be a genius to figure out what a double stroller is. A double stroller is specially designed to fit two babies or one baby and an older kid, while providing them with comfort and safety, at the same time, giving convenience and peace of mind to a parent. So, a double stroller is very handy for parents and investing in a good model is absolutely necessary. This model is the most popular one, as it is very comfortable for kids. It is spacious enough, so the kids will have freedom while interacting with each other. However, these models are too wide for some doorways, so keep that in mind. As the name implies, these models are designed in such a way that an older kid can stand on the platform, while a baby is in the seat. Having this model brings lots of fun for older kids, allowing a parent to push the stroller with ease. These models have the same width like a standard single stroller, allowing you to put one kid in front and another one behind. Obviously, double strollers are designed to make going to town or going for a walk with your little ones much easier. Some pricier models come with amazing features, giving you extra convenience along the way. Much like a single stroller, these models are also safe for kids thanks to high-quality fabrics, wheels, handle and straps. Naturally, more expensive double strollers come with much better safety features, so, if you can, buy one of those models. One more benefit of double strollers is an interaction between your kids. The best model for this is a side-by-side stroller where your kids can laugh and interact while also having enough space for their legs and leaning back in the seat. We all know how demanding kids can get, which is why you need to get a versatile double stroller. Meaning, some models can be configured in different ways, for ensuring maximum convenience and comfort to your kids. Well, you definitely need to get a high-quality double stroller that will be perfectly safe for your kids. This is especially important if you are buying a stroller for newborns. So, make sure you choose a double stroller with as many safety features as possible. Another thing to think about is the design. How heavy is the unit? What about the dimensions? Then, is it easy to fold and store? If you have a small house, you definitely want a stroller that can be easily stored. Also, keep in mind the comfort. Since manufacturers try to keep a balance between the size and the price, the comfort of the seat can be easily put in another plan. Another thing related to the design of a double stroller is the look. 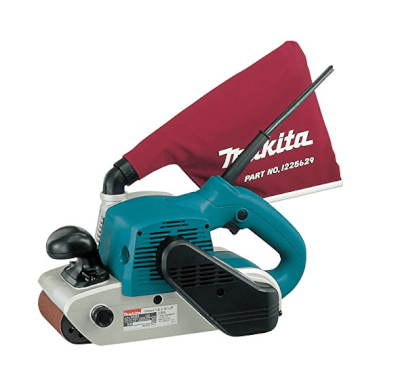 First, you will probably want to buy a model that looks nice BUT is also easy to take care of. Meaning, don’t buy a bright-color stroller because it will be easy to get dirty, especially if you have a toddler and a baby. Go with a darker fabric that is easy to clean with wet wipes. Of course, no need to worry about finding the model that will fit your style, since there are a plethora of double baby strollers on the market, leaving you with a million of options to choose from. The last thing to keep in mind is compatibility. Do you plan to use a stroller with an infant car seat? Then make sure to buy a model that is universal, so you can use it for accommodating most popular seats on the market. Well, parents, now that you have gone through Best Double Strollers Guide, you are ready to find the best model for your children. With a good double stroller, taking care of two kids will be much more convenient and safer, leaving you with peace of mind. So, choose wisely, and get the best double stroller that you can afford so that your kids (AND you) enjoy the ride.